Jack Daddy Loops AKA Loopty - "A Tribute To Brockport: Vol. 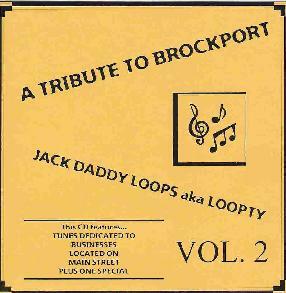 2"
Jack Daddy Loops AKA Loopty (aka Barry Greenberg) follows up his tribute to fellow businesses on Main Street in Brockport, NY with a second volume. Lots of variety on this one. On "Liftbridge", Jack Daddy explores a kind of R&B/Prog blend, with a cool organ sound I've not heard from him before, and pumped up by the electro beats that are so characteristic of the Jack Daddy Loops sound. "Arjunia" consists of a hip-hoppy brand of Funk, accompanied by a cosmic keyboard sound and melody, but also a lighter piano and harp sounding melody. I like the spacey elements better, but we're really getting a very cool blend of contrasting sounds and styles on this set. "C & S Saloon" is a quirky beat dominated tune that includes Funk and spacey bits. I like the effect of the equilibrium disrupting beat patterns that intermittently level out when a space wave or acoustic guitar-ish keyboard melody is briefly introduced. "The Fitness Shoppe" and "Bicycle Outfitter's" are among my favorite tracks, consisting of ultra cosmic dance-pop for robots. Another highlight track is "Brockport Computer", with its lulling melodies, fuller prog rock sections, and loads of alien electronics that keep things nicely strange but accessible. But my hands down favorites were the ones that are the most different from what I've heard to date in Jack Daddy's music. "Lorenzo's" begins with a soulful jazzy sound that struck me as a combination of Traffic and Sun Ra. Weird huh? I like it. But then the main theme kicks in which is a big band dance tune with ethnic influences and a party down in Rio vibe, with bits of Beat jazz thrown in as well. And "Pizza And A Haircut" goes down a completely different path, being a heavy rock tune with nasty metal guitar chords, but also the kind of spaced out beat mania that sets this apart from most heavy rockers you'll hear. Ok, Barry... how about an all heavy rock album given the Jack Daddy treatment? Overall, I'd say this album is a highlight in the Jack Daddy series.